Christmas Gift Vouchers For Driving Lessons -- Give The Gift Of Freedom! The Perfect Gift Idea for Christmas! Gift card orders received before 20th December 2018 are guaranteed for Christmas Day! Buy with confidence — driving lesson gift vouchers are valid for up to one year from purchase! Stuck for present ideas for the teenager in your life? Do you have a friend who’s always be meaning to learn how to drive? Maybe you’re just tired of being an unpaid chauffeur? Buy one of our driving lesson vouchers this Christmas and give somebody you care about the gift of independence. Cash is so often easily spent on other things. A gift voucher is the perfect way to give a thoughtful present that will help your loved one gain a valuable life skill. Read on to learn more about our driving lesson gift card deals. For just £25 you can buy someone a driving voucher for a two-hour beginner’s taster lesson. There are no strings attached — the lucky recipient will have an opportunity to take us for a test drive before they commit to anything at all. What a great way to give a budding learner driver an exciting driving experience. What better gift idea is there than to give a taste of the freedom that comes from becoming an independent driver? Our block booking deals are the perfect way to give your friend or family member a head-start with learning to drive. The more hours you buy in bulk, the bigger the discount. This is the best way to get cheap driving lessons and set your loved one up for success! We have a range of Christmas gift offers to suit every budget. 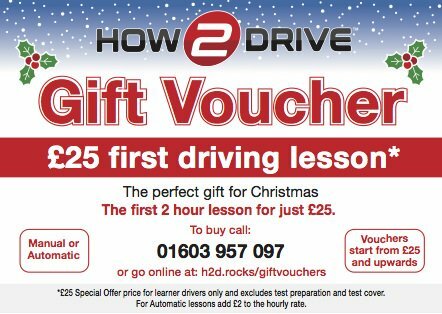 Not only do our driving lesson vouchers make for thoughtful presents, they’re also a great way to get a discount off of our standard driving lesson rates. So if you’re stuck for Christmas gift ideas for teenagers why not give the gift that keeps on giving? All packages include a half-price two hour taster session for beginners. Finding the right school of motoring is difficult. That’s why we offer our beginner’s two hour taster session at a 50% discount. Feel free to learn more about our driving lesson offer and what makes our driving academy different. Order Your Xmas Driving Lesson Voucher From Just £25! The perfect present idea for Christmas! Questions? Call 01603 957 097 to chat with us today!